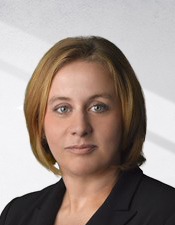 Keri is a partner in the firm’s Bankruptcy & Restructuring practice group. She handles commercial, consumer, and real estate bankruptcy matters. Keri currently serves as co-chair of the Allegheny County Bar Association Bankruptcy and Commercial Law Section, which is responsible for studying bankruptcy and commercial law and informing its members of proposed changes to related legislation. A member of the American Legal & Financial Network (ALFN), Keri was awarded the 2017 JPEG: Picture the Future Award, which recognizes stand-out young professionals for their achievements and commitment to the mortgage servicing industry. She is a member of the ALFN’s Bankruptcy and Women in Legal Leadership Committees. Keri is also involved with the Judith K. Fitzgerald Western Pennsylvania Bankruptcy American Inn of Court. She is licensed in Pennsylvania and New Jersey, and is admitted to practice before the U.S. District Court for the Eastern, Middle, and Western Districts of Pennsylvania; the Northern and Southern Districts of Indiana; the Eastern, Northern, Southern, and Western Districts of Texas; the Third Circuit Court of Appeals; and the U.S. Supreme Court.